The flow of air into the car can be blocked by leaves or road debris in the supply tubes or in the plenum chamber. A typical heating and ventilating system, with heater ducts to the windscreen and to the front foot-wells. The plenum chamber is a box fitted on the bulkhead beneath the windscreen. It takes in fresh air from a grille on the outside of the car. Inside the chamber, movable flaps connected by cables to the heating and ventilation controls of the car divide and direct the air to the different parts of the interior. Incoming air is warmed by passing it over the fins of a small radiator, called a matrix, which takes hot water from the engine. The matrix is usually inside or next to the plenum chamber. Sometimes the supply tubes slip off their connections, or the interior lining of a tube may collapse and block it. There is usually a simple valve at the base of the plenum chamber which allows water to drip out — either through a flap or a rubber tube with lips that just touch each other. Remove the valve or the tube to clear leaves or debris from the chamber. To check the trunking, pull it off in sections and look through it. If it is a loose fit on its connector stub, push the trunking well home then bind the joint with sticky tape. Alternatively, use tape to build up the stub, which will then make a tighter fit with the tube. Trunking that is loose fitting reduces the efficiency of the heating or ventilation. An incorrect flow of water through the heater matrix may be due to stretching in a cable which operates a water valve on the engine. Ask a helper to work the hot-cold lever in the car while you check that the lever on the valve is turning through its full travel. A kink in the heater hoses can also restrict the water flow. If a hose feels squashy it may have collapsed internally, and should be replaced. An airlock in the heater system or a build-up of sludge in the matrix also reduces heating efficiency. Disconnect the heater-return hose at the bottom of the heater or at the water pump and run the engine. There should be a good flush of water. A trickle means the matrix is blocked. Remove the drain tube to clear out dead leaves and debris. First remove the plenum-chamber drain valve by slackening the hose clip. With the valve removed, tip out any debris blocking the valve and clear the drain tub. This type drains into the engine bay. Test the drain valve with a forefinger. The lips of the valve are shaped so that they remain closed when water is not draining though them. Flick open the lips of the valve to see that they close. If they do not, replace the valve and hose clip. Disconnect at the engine end and direct water away from the engine. Air is forced into the car by road speed, or sucked in by blower. 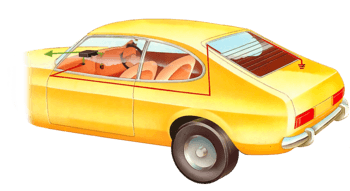 Normally, fresh air enters though a grille in the front of the windscreen, and its deducted into the plenum chamber. The chamber channels some through the heater matrix. Stale air is removed though the extractors at the rear. Part of the airflow can be can be deflected to demist or defrost the windscreen. To check the demist vents, tape narrow strips of tissue paper to the vents. Switch on 'demist' and then 'defrost' with the blower switched on. Both strips hsould be blown upright. If they are not - or if only one moves - make sure the trunkings from the heater box are firmly connected at both ends. Reconnect any that have slipped off. An external water valve controls the flow of hot water to the heater. Make sure its operating lever can turn easily through its range. Check the tightness and adjustment of the operating cables and linkages. Check for leaks at the hose connections. Follow the hoses through to the heater, and look for signs of rubbing, kinks, cracking or spongy areas. 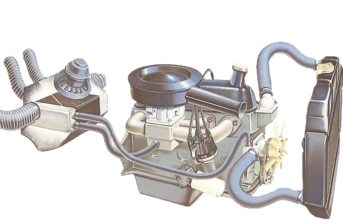 The water valve may be on the heater box, as here, or on the cylinder head. If you need to change a section, take the old length along to the spares shop and buy one the same size. There are many variations in diameters and fittings depending on the make, model and year of your car. It is possible to flush the heater matrix without removing it from the car - which may sometimes be difficult. Disconnect both heater hoses at the engine end. The water that pours put can then be directed away from the engine. Move the heater control to hot', then connect a garden hose to the return pipe - the one attached to he radiator bottom hose or water Dump. Turn on the tap and flush the matrix until water collected in a jam jar is free of sediment. Repeat with the garden hose connected to the feed pipe. If an airlock is restricting the flow of water, bleed the whole system. 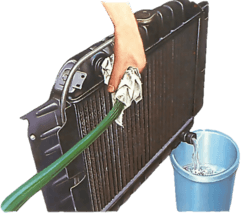 Disconnect the return hose at its most convenient end, top up the radiator and start the engine. Seal the hose with your thumb, then wait until the water runs freely from the heater with no air bubbles. This normally takes from five to ten seconds. Reconnect the return hose, tighten its retaining clip and top up the radiator. Always bleed the system when the engine is cold to avoid being scalded by coolant. A cold engine also means the thermostat is closed, so more water is forced through the heater.